North Country Unfading Black meets or exceeds the requirements of an S-1 rated roofing slate under ASTM C-406. This fine material is available in smooth textured 3/16”, ¼” and 3/8” nominal thickness as well as medium textured ¼” nominal thickness. North Country Unfading Black smooth textured slates are produced to the most stringent European fabricating standards, standards that are well beyond those of the North American roofing slate market. North Country Unfading Black medium textured slates are produced as “fall out” from the production of smooth textured slates and exhibit slight variations in texture, veining, tear back and thickness, providing more definition in the appearance of the roof. 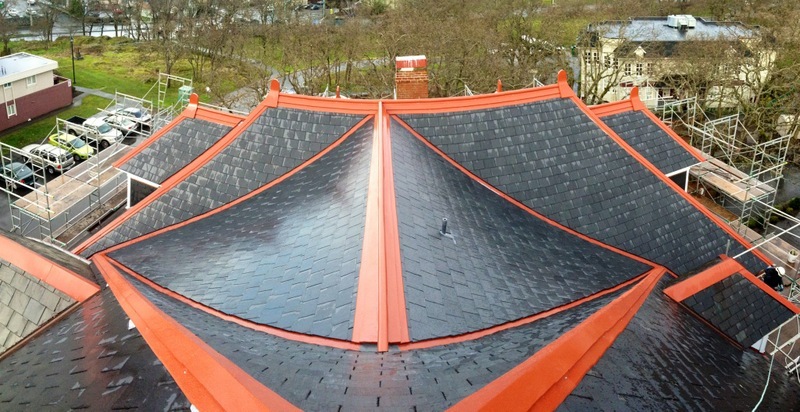 These variations are well within the standards applied to the North American market and medium textured slates are available at a significant savings. There is no compromise to material quality. North Country Unfading Black roofing slate arrives on site in fully enclosed pallets with virtually zero breakage reported by consistent users. Slates are machine punched, not drilled, and of extremely uniform face dimension tolerances. Installers remark on the ease with which they can be cut and trimmed.